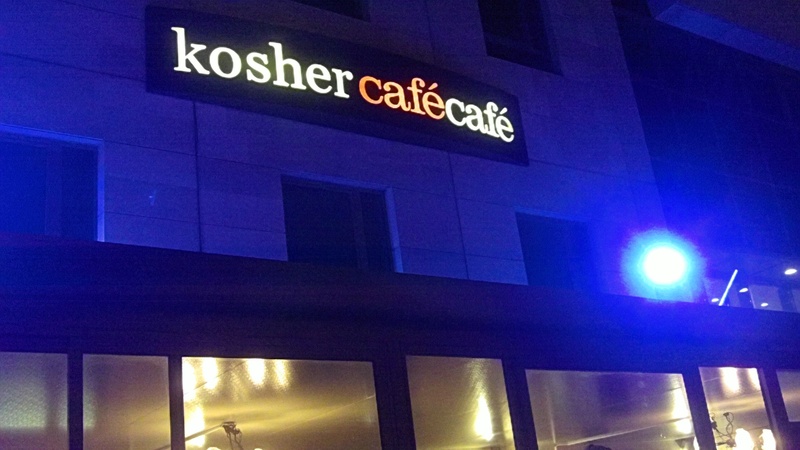 Kosher Info: You will not have a hard time finding kosher food in Rechovot, as the city is populated with kosher restaurants and quick off the street grub (think shwarma & falafel). The majority of the eateries are located in 3 areas, which, depending on your purpose of visiting Rechovot, will come in handy. 1) On Rechov Herzl. The main drag that cuts through the city from one end to another is filled with cafés and open shwarma / falafel places, which are often quite good. 2) In the Rechovot Mall (called the Kanyon "קניון" in Hebrew). On the mall's lower level there's a food court alongside the movie theater. All of the food court's eateries have a kosher teudah (certificate), albeit from varying kosher agencies, except for the McDonalds. 3) In the Tamar Science Park on the border with Nes Tziona. One of the newer areas of the city directly north of the Rehovot train station, the modern office park has numerous kosher establishments, on the nicer / pricier side, catering to the local business clients. There are kosher restaurants outside of these 3 areas, but none that I have tried (or that my family in Rechovot recommend. The following restaurant descriptions are courtesy of my cousin Shoshanit who is a Rechovot native. Papardella – A dairy restaurant in the Science Park. The food is yummy, specially known for its good pastas. Pretty crowded in the weekends. Cafe Joe – There is one in the mall and one in the Science Park. The one in the science park is nicer, atmosphere-wise. The food is good and generous. One problem – they let people smoke in the balcony which is the nicest place to sit. Cafe Joe is a chain and can be found in many cities in Israel. [Kosher] Cafe Cafe – In the science park. The food is nice, the Kashrut is Mehadrin, there's a big variety of servings, the place is pretty and the bathrooms are fancy and clean. 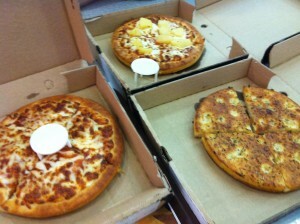 (from Dani – we ate there the night we arrived – I wasn't impressed personally but my cousins all seem to love it there). Rolladin – A nice cafe / bakery near the train station. The food is nice, sitting outside is very pleasant next to other cafes. Inside there's a warm and cozy atmosphere. They serve various fancy sandwiches, pastas, and other dairy dishes. ORO – A fancy chef restaurant known for its tajins – special Moroccan dishes. Yummy. 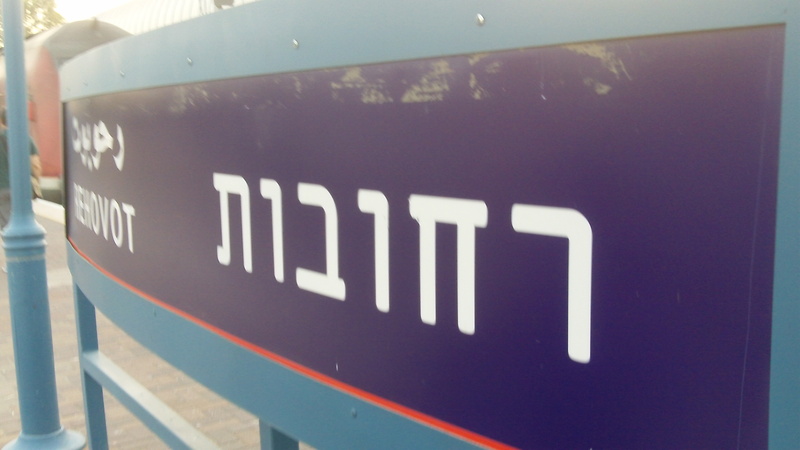 There are actually 3 branches (as far as I know) – one in Rishon LeTzion (about 10mins north of Rechovot), one in Moshav Galia near Rechovot, and one in Rechovot near the train station (I'm not sure if it still exists). In the Rechovot mall food court, I have had the opportunity of trying many of the kosher eateries over the years visiting this town. Sbarros Pizza – one of the American chains that are kosher in Israel. Their pizza comes with a choice of many toppings, and is typically smaller but much thicker than American / New York style pizza. You buy pizza by the slice. Burger Ranch – another chain restaurant which Israelis seem to love, but I am not a huge fan of their style and flavor of burgers. The kosher Burger King restaurants in Israel were much tastier – but on my most recent trip I was unable to locate any. China Town – I was always scared to try Chinese food in Israel after a bad experience 10+ years ago. China Town looks like it could be decent, but when in Israel, I'd rather have something that tastes good with chummus. There are a few shwarma/falafel/pita places in the Rechovot Mall food court. I've rarely complained when eating shwarma in a fresh pita with chummus in Israel. It's (almost) always good. Tourist Info: Rechovot is not known as a tourist destination, however, many more visitors are coming to the city for business purposes, typically to the Tamar Science Park on the north end of the city past the train station, where many hi-tech and bio-tech companies have moved in over the past few years (including HP and Africa Israel), which could be partially due to its close proximity to the Weizzman Institute (Machon Weizzman) adjacent to the Rechovot train station. The Weizzman Institute itself is an interesting place to visit, as the campus is beautiful and they have an outdoor science park on the premises. The entrance to the campus is on Herzl St. (Rechov Herzl) on the northern end of the city, walking distance to the train station. Rechovot is historically known for its orange groves, hence the oranges on the city's crest (see top image), but today, oranges are tough to find in the now large Israeli town of approx 115,000 people. A historical site worth visiting is Machon Ayalon, an underground ammunition factory used before and during Israel's War of Independence. The interesting part was that it was done entirely in secret, with a 10 ton oven and large washing machine covering the entrance to the underground facility and masking the sound the bullet machines made. Definitely worth a visit. Call 08-9406552 for info and to make a reservation (which is required to visit). They also close early, 4pm everyday and 2pm on Fridays. Rechovot is about 20-30 minutes south east of Tel Aviv (depending on the traffic). The only non-Jews in Rechovot are likely the Vietnamese and other Asians living working in the region, as well as a minority of Russians who migrated to Israel (but are really not Jewish). The Orthodox population in the town is sizeable, with multiple dati leumi shuls, a large charedi "Kreitschniver" community, and an Anglo shul called "The Berman Shul" on the campus of Yeshivat HaDarom. Most American, English, Canadian, South African, and Australian immigrants to Rechovot are affiliated with that community.